An ambush is a surprise attack against an enemy target from a concealed position. In an ambush, the target is normally in motion and the attack force in stationary and prepared for an attack. An ambush can either be deliberate or hasty (spur of the moment). It can be near or far. Near usually means within grenade throwing range or sometimes as far away as 200 meters. Far usually means 300-500 meters or more. Far ambushes usually mean there is no thought to search the bodies and often suggest the use of artillery, mortar fire, remotely detonated mines, or sniper fire. Deliberate Ambush: A Deliberate ambush is when you set up along a known or suspected route of the enemy, wait for them to arrive and then you attack with surprise and and overwhelming force and quickly withdraw from the area. The ambush can be done to gather intelligence, destroy enemy capabilities, or just to keep the enemy off guard. Sniping is a special kind of far ambush, typically designed to harass the enemy or eliminate key enemy targets to demoralize or weaken enemy resistance. Hasty Ambush: The hasty ambush is an unprepared, spur of the moment ambush. Many units makes contingencies and rehearse to ambush targets of opportunity so that they can set up an ambush if the need or circumstances dictate.The hasty ambush differs from the deliberate in that the unit's actual mission was not an ambush but they ended up doing it anyway. Intelligence gathering: Stake out an known route of the enemy to destroy/capture enemy vehicles and personnel in attempt to secure vital information on upcoming enemy operations or to plan a current allied attack. Harassment: Attack the enemy where they do not suspect trouble forcing them to divert needed supplies and personnel from a more vital spot, thus weakening the enemies overall effectiveness. Assassination/Capture: Based on intelligence attempt to capture or kill key figures of the enemy's organization in order to disrupt the enemy's morale and/or combat capability. 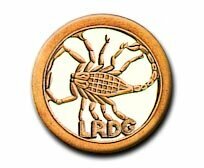 How did the LRDG do it? According to Lloyd Owen and others, the LRDG often conducted an ambush from the back of their trucks. They would back up their trucks to the ambush site with bonnets (hoods) facing away from the road and space the trucks about 25 yards (meters) apart. They would often sit for hours waiting for just the right target to come by. One such target would be fuel trucks. Besides shooting up the enemy vehicles they would quickly look through papers and check for radio frequencies but would not spend a long time at the ambush site (kill zone). After or sometimes while waiting on the enemy they would cut down communication lines. On some occasions, after committing the ambush, they would tear down the road, traveling after other vehicles that had passed through the kill zone, shooting them up as they came upon them. After the excitement was over, they would head off into the desert making sure to mine the path they took in their escape. According to one passage, they would often tie the communication lines to the back of their trucks and head off in the desert with long sections of the wire trailing behind them in order to make it more difficult for the enemy to fix the lines. Lloyd Owen did not go into specifics of how to set up an ambush other than the information above. However the basic plan for an ambush is easily applied to the vehicle mounted ambush Lloyd Owen described. The common method in ambushes is to set up two arcs of fire which will fire down and across the ambush site. This is often called an L shaped ambush especially if it occurs at a bend in the road. This basically closes the bottle of the ambush while the rest of the patrol fires into the side of the enemy. When you do such an ambush you usually place your most deadly weapon at the bottom of the "L". It doesn't matter which direction the enemy approaches. The ambush isn't triggered until the the enemy is in the kill zone. Ambush patrols are usually divided into two parts. Today, these parts are called assault element and the support element. The assault element is closest to the kill zone and will be the party to enter the kill zone after the ambush to gather information. The support element provides flanking and rear security and usually has the heavier weapons. In the L schematic below, the Breda gun and far left Lewis Gun are the Support element while the six guns in the middle make up the assault. In the example below, there is no suitable bend in the road which seems like the case in many of Lloyd Owen's account. therefore the ambush is modified slightly. The main gun, the Breda, fires down the road from a location along the side. This is the bottom of the L or the cap on the bottle. Three other trucks set up along side the kill zone and the fifth truck in the ambush provide security and seals the bottom of the ambush. The main arcs of fire come from the vehicle mounted machine guns while supplemental fire comes from either small arms or a second machine gun either mounted on the truck or perhaps a Lewis gun near the truck. No one wanders far from the trucks in case they need to leave in a hurry. The two end vehicles also provide flank security (support). The middle trucks comprise the Assault element. The sixth patrol truck, the wireless truck is left behind some distance at a rendezvous point and cover the rear in the event the patrol must leave quickly (reserve). Two men watch both directions along the road for reinforcements. On the far side of the kill zone, the patrol has placed mines to make it more difficult for the enemy to escape. If this patrol had no intention of searching the enemy after the ambush, they may have mined the road on both sides so the enemy couldn't charge them. Each trooper is given a specific area to fire at. Today this is called of "field of fire". By doing so, the patrol knows every area of the kill zone will have the maximum amount of fire and reduce the risk of the enemy getting away. The arcs of fire overlap so in the event someone is unable to fire, the area is still covered (interlocking fields of fire) The vehicles are facing away from the road with the drivers in their seats or close by so that the patrol can scoot away as quickly possible. Patrol Commander Lloyd Owen said he signaled the ambush by blowing a whistle. Today, most ambushes are signaled by the commander opening fire with the heaviest gun or by setting off a mine or other explosive device. 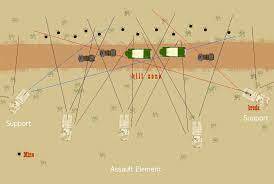 Possible plan for an LRDG ambush. The patrol sets the assault element vehicles 25 yards apart with the support vehicles as much 50 to 75 yards farther down the road. The vehicles set up about 50-75 yards from the road to prevent being seen or quickly overrun by the enemy. After the ambush, the patrol would search the vehicles and men for information (unit insignia, radio frequency, special equipment) and cut any telephone or electrical lines along the road. As they leave the scene, the patrol would place mines along the route of departure for anyone foolish enough to follow them. The favored target of the LRDG were fuel and communication trucks. A target they avoided was anything armored.